A bowhead whale caught by Igloolik, Nunavut, hunters. Photo by Ansgar Walk. Gabriel Nirlungayuk can’t pinpoint when Inuit first began hunting bowheads. “Whaling, from an Inuit perspective, has been ongoing since time immemorial,” says the director of wildlife and environment for the land-claims group Nunavut Tunngavik Inc. But he knows one thing: It wasn’t always so heavily regulated. Currently, Nunavummiut are permitted to harvest three bowhead whales per year. The territory’s 25 communities and two outpost camps compete each year—and the stakes are high. 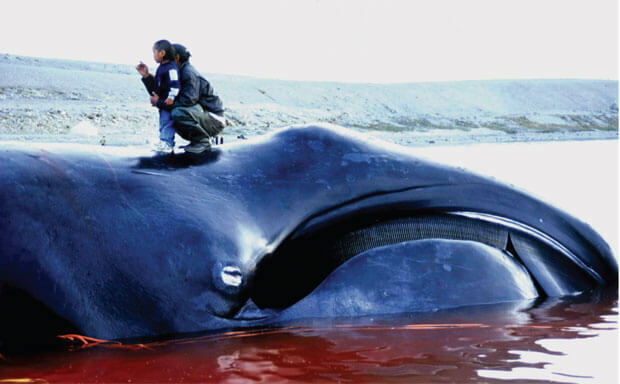 Whaling is an indispensable way of life for Nunavut’s predominantly coastal communities. In August, thanks to healthier bowhead whale numbers and favourable conditions, hunters in Iqaluit caught their first bowhead whale in more than a century. …But conservation methods must ensure the health of the Arctic whale population. Whale hunting in the North has long been controversial. Governments and biologists carefully monitor whale numbers, with conservation officers enforcing quotas, licences, and inspections before and after hunts. Some conservation groups, such as Sea Shepherd, say it’s still not enough. “I do not believe in cultural justifications for slaughtering wildlife if other redress is available for survival,” says Sea Shepherd’s Capt. Paul Watson. More moderate groups, such as the World Society for the Protection of Animals, believe subsistence hunts should become more humane, cautioning any form of whaling has the potential for severe negative impacts for animal welfare. “WSPA urges all whalers, including aboriginal subsistence whalers, to consider the increasing and irrefutable scientific evidence that all whaling causes immense and prolonged suffering,” says Joanna Toole, the oceans campaign coordinator for WSPA. Bowheads have been precariously close to extinction: the zealous commercial whaling that ended decades before put the bowhead whale on the endangered species list in the 1980s, and they were only downgraded to “special concern” in 2009. However, numbers are on the incline off the coast of Nunavut and in the Hudson Bay. The Department of Fisheries and Oceans revised its estimates from hundreds to thousands in 2008 and continues to survey the population. As the whale population strengthens, so too does the Inuit argument for putting conservation and culture on equal footing.